The Evolution of Biryani that we all wanted to know because it’s Biryani..!! Biryani is derived from the Persian word ‘Birian’ . In Farsi, Birian means ‘fried before cooking’. It could have come from Persia via Afghanistan to North India. Based on the name and cooking style (Dum) it can be concluded that the dish originated in Persia or Arabia. One theory is that the word biryani comes from the word ‘birinj’ which is a persian word for rice. Another theory is that it is derived from the word ‘biryan” or “beriyan” which means to fry or roast. A rice pilaf with meat called büryan is made by the Turkish and other Muslim communities of Macedonia. It could have been brought by Arab traders via Arabian Sea to Calicut. During the Mughal rule Lucknow was popularly known as Awadh and it is still famous for its aromatic Awadhi Biryani. In 1856 British deposed Nawab Wajid Ali Shah in Calcutta giving rise to the quintessential Calcutta Biryani. He lived in a suburb of Metiabruz, near Calcutta,. He bought his khansama or royal cook along with him. He popularized the biryani in the city. Aurungzeb installed Nizam-ul-Mulk as the Asaf Jahi ruler of Hyderabad and this led to the rise of ‘Hyderabadi Biryani’ and ‘Arcot Biryani’. Which soon became the royal food of Nawabs and Nizams. Tipu Sultan of Carnatic made Biryani a popular dish of Mysore. The Nizams employed vegetarian Hindus as book keepers and they influenced the cooking of biryani, thus Tahiri Biryani came into being. Biryani in the past was actually an army dish because they would prepare a one-pot dish where meat and rice were available. They couldn’t cook elaborate meals. Over the time, the dish became biryani due to different methods of cooking. The people of Hyderabad, Lucknow and Calcutta for example are proud of the ‘Biryani culture’ in their city and also super-sensitive about it! There are two types of Biryani namely- the Kutchi (raw) biryani and Pukki (cooked biryani). For Kutchi biryani the meat is layered with raw rice in a handi and cooked. 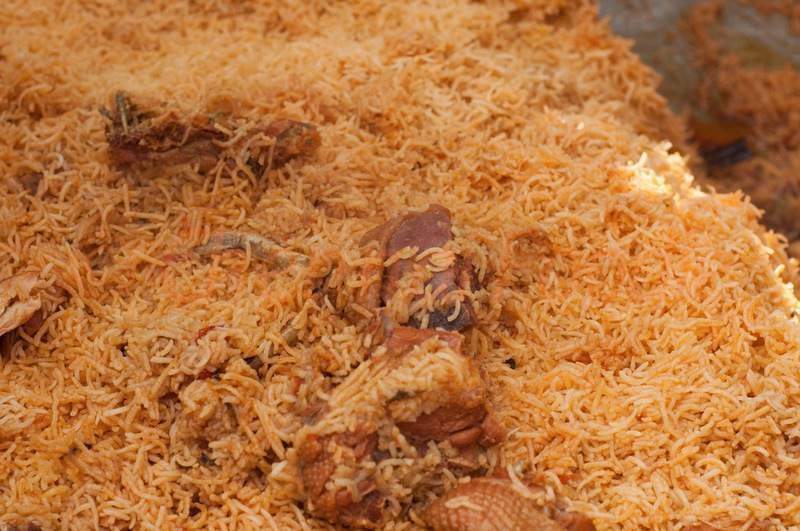 For Pukki biryani cooked meat and rice is layered in the handi as a finishing touch to the cooking. The Lucknow or Awadhi biryani is an example of pukki biryani while the famous Hyderabad biryani is the Kutchhi biryani. In the olden days, the rice was fried without washing in ghee to give it a nutty flavour and burn the starch to gelatinize it. This means the rice will not clamp together when blended with meat. Long-grain brown rice was used in northern India while in the South the Zeera Sambar rice is used. Basmati rice is usually used these days. The meat of the biryani is marinated with papaya, whole-milk yogurt and spices and thereafter it may be cooked. In an earthen pot or handi the rice and meat is layered. The bottom and top layers are always rice. In between the layers of meat and rice condiments are introduced like cardamom, mace, screwpine essence, rose water to give the biryani a strong herbal aroma. The handi is sealed and put on coal embers to cook. In Calicut, the handi is placed on embers produced by coconut shell. When the biryani is about to be served the seal is broken and the whole room is filled with aroma that will make you salivate instantly. In Hyderabad, biryani is served with raita and mirch ka salan. 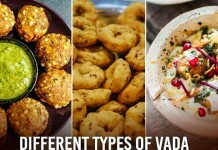 In kolkata and lucknow it is served alongwith raita and salad and some kebabs maybe. You actually don’t need any sides for biryani because it is a meal in itself. The spiciness of the Hyderabad biryani completely depends from the restaurant your having the biryani from. Many have the famous chicken 65 as a side dish with the a plate of steaming Hyderabadi biryani. Simply finger licking delicious! The ingredients are chicken, spices and a type of rice known as khyma. Khyma rice is mixed with ghee. A huge amount of cashew nuts, sultana raisins, fennel-cumin seeds, tomato, onion, ginger, onion, shallot, cloves and cinnamon are used. Small amount of chili powder is used in the preparation. It is a type of pakki biryani. A fragrant variety of rice known as khyma or jeerakasala is used. The dum method of preparation is also applied here. 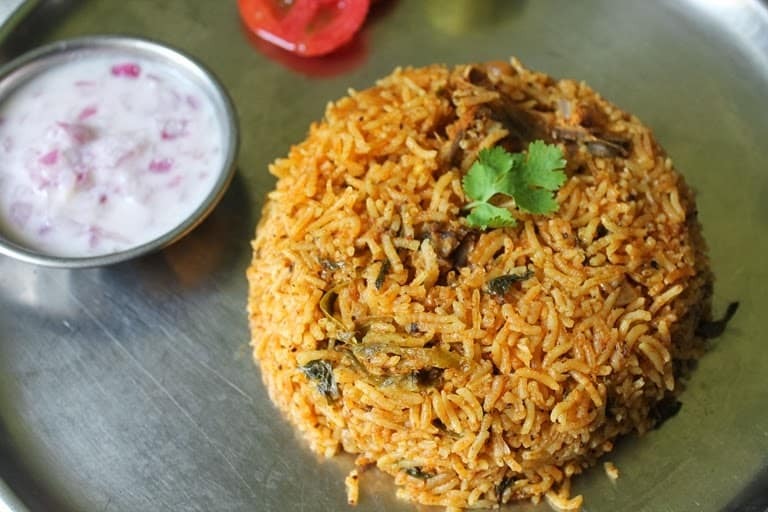 This type of biryani is cooked in the towns of Ambur and Vaniyambadi in the Vellore district of Tamil Nadu state. This biryani was introduced by the nawabs of Arcot who once ruled this place. The Ambur biryani is accompanied with ‘dhalcha’ or a sour brinjal curry and ‘pachadi’ or raita. The raita is made with plain curd, tomato, red chilies and salt. The use of spice is moderate and curd is used for a thick gravy base. The quantity of meat in the biryani is more than rice. This biryani is light on the stomach. Memoni Biryani: This is an extremely spicy variety of biryani made by the Memons (Muslim commercial community from the western part of South Asia. They are associated mainly with Kathiawar) of Gujarat-Sindh region. It is made with lamb, yogurt, fried onions, potatoes and fewer tomatoes compared to Sindhi biryani. Memoni biryani uses less food colouring compared to other biryani. All you get is the natural colour of meat, rice and vegetables devoid of the orange colour. This biryani is famous in the Dindigul town of Tamil Nadu. It uses little bit of curd and lemon juice to add a tangy taste to the biryani. Bohri Biryani: This biryani is flavoured with lots of tomatoes and it very popular in Karachi. Kalyani Biryani: This is a typical biryani from Hyderabad also known as the ‘poor man’s’ Hyderabadi biryani. This biryani is made with cubes of buffalo meat. The meat is flavoured with ginger, garlic, turmeric, red chili, cumin powder, coriander powder, lots of onions and tomatoes. The meat is first cooked as a thick curry and then blended with rice. It is then given dum (Indian method of steaming in a covered pot). The kalyani biryani originated in Bidar during the reign of the Kalyani nawabs who then migrated to Hyderabad. Kalyani nawabs served their subjects with this unique biryani during their visit to the noble mansion. After the Operation Polo, when Indian army took over Hyderabad State and the rule of nobles went into a decline. The illustrious cooks set up their own stalls in Hyderabad and introduced the Kalyani biryani to the common people.